Before the canyon emerges into the San Joaquin plain it winds into a flat of perhaps two or three hundred acres surrounded by low rolling hills and covered with oaks scattered here and there, like a park. And such oaks! How I wish you could see them—nearly worthless for timber, but surely the most magnificent trees one could desire to see. Brewer arrived at the home of John Marsh, a noteworthy settler of the interior of Contra Costa County. The next day, on May 29, 1862, he collected Mount Diablo buckwheat on a dry hillsides at Marsh’s ranch—thus documenting a species new to science. Since 1862, Mount Diablo buckwheat has been collected by six different botanists at up to potentially seven unique locations. One of the more notable collectors was Dr. Mary Bowerman, whose dissertation focused on the flora of Mount Diablo. In 1936, 69 years ago, Mary was the last person to collect Mount Diablo buckwheat before it was presumed extinct. 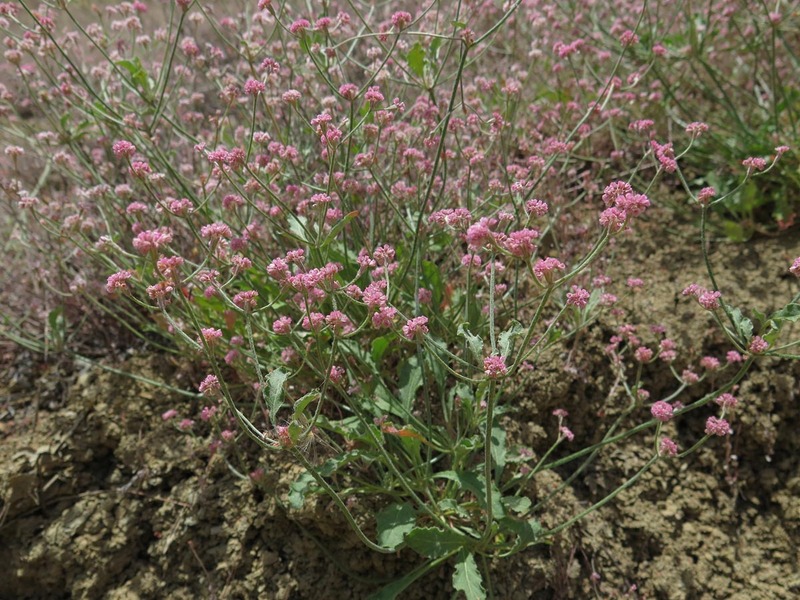 Then on May 10, 2005, Michael Park discovered Mount Diablo buckwheat along the chaparral margins on the south side of Mount Diablo. At the time, Michael was an undergrad at UC Berkeley working on a senior thesis project collecting floristic data on under-explored parts of Mount Diablo. At that time he found only 20 plants growing at the site. After the rediscovery, botanists, natural resource managers, the California Native Plant Society, and other conservationists quickly formed a working group to provide needed stewardship and monitoring.Seeds were immediately collected and amplified at the UC Berkeley Botanic Garden by Holly Forbes. The group also planted seedlings, but attempts to establish new populations on Mount Diablo were unsuccessful. Concurrently, the number of plants at the natural population declined. Michael Park stated numerous times that the working group was on extinction watch, despite efforts to document new populations though annual “Find a Buckwheat Day” events. Heath Bartosh and Brian Peterson in a field of buckwheat. 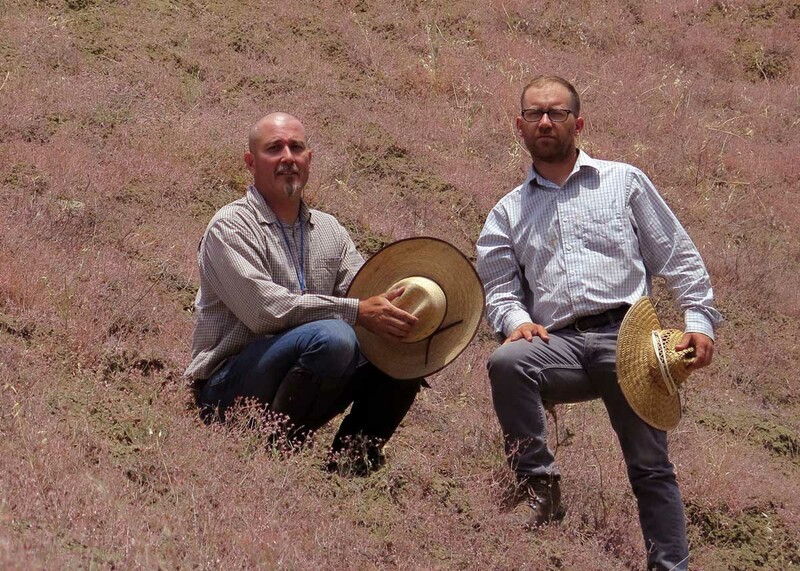 It wasn’t until 11 years later that Nomad Ecology botanists Heath Bartosh and Brian Peterson found a new population while performing rare plant surveys in support of the land-use plan for Black Diamond Mines, working on behalf of Michele Hammond of the East Bay Regional Park District. On that day, May 19, 2016, Bartosh and Peterson observed a sizable population growing in the Sand Creek corridor along the northeastern slopes of Mount Diablo. While it seemed too good to be true, the duo quickly realized what they discovered. The distinctive wishbone-like structure of the inflorescence, pink pom-pom flowers, hairy stems, and elongate leaves were a dead giveaway. This could be considered the discovery of a lifetime, and with the find, the extinction watch ended. Most striking about this population was the sheer numbers of plants. Nomad Ecology botanists estimated that over 2 million individuals were growing. The size of the plants was equally remarkable, as the individuals at this site are much bigger than what was found at the rediscovery site by Michael Park. With this 2016 discovery, botanists now have the chance to monitor the population, observe its fluctuations, and vigilantly watch for threats to its long-term existence. This entry was posted in Endangered Species, Wildflowers. Bookmark the permalink.